I was speaking to an influencer the other day who asked me to look at some of his sponsored content. At the end of each post, which could be seen only if you expanded the post, he'd used the hashtag #[BrandName]Partner. I told him that his disclosure didn't comply with FTC guidelines in part because it didn't come early enough in the post and wasn't clear what being a "partner" in this case meant. His answer? "This is what the brand's lawyers told me to do." 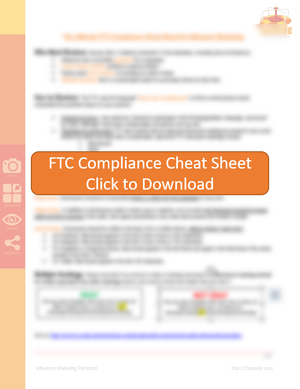 Having said that, we know that keeping up with FTC compliance can be a little tricky. Since we do it every day for brands, we've created our own internal cheat sheet and today, for the first time, we're offering that cheat sheet to anyone that wants it, at no charge. DISCLAIMER: We are not lawyers and the cheat sheet below is not legal advice. If you're so inclined or have questions, consult your own legal counsel. Print it out, stick it up on your desk, or share it with your legal, marketing, and influencer teams. We have significant amounts of data showing that influencer marketing, properly disclosed, can still drive dramatic sales results. If the industry is to be mature and credible, we should all be complying with these guidelines.